The Bell AH-1G Cobra is a single-engine attack helicopter that served as a primary gunship of the US Army from the Vietnam War up to the late 1990s. It was developed in response to the success of the Bell UH-1 ‘Huey’ multipurpose helicopter, particularly in air cavalry operations, and the need to protect the Hueys from ground fire. To this end, the Cobra shares the same hardy Lycoming turboshaft engine, transmission and rotor system of the Huey, and has a two-seater fuselage with controls for both piloting and weapons in both cockpits in case one pilot becomes incapacitated. For armament, the AH-1G has a standard 20mm chin cannon and can carry a variety of miniguns, cannons, rockets and missiles in its wing stubs. The Cobra entered service in the US Army, performing ground support, anti-armor and reconnaissance roles, until its replacement by the AH-64 Apache in 1999. Like its namesake, the AH-1G Cobra helicopter brought swift and deadly force to its enemies. And you too can experience this badassery in helicopter design and engineering with the AH-1G Cobra 1/32 helicopter scale model. 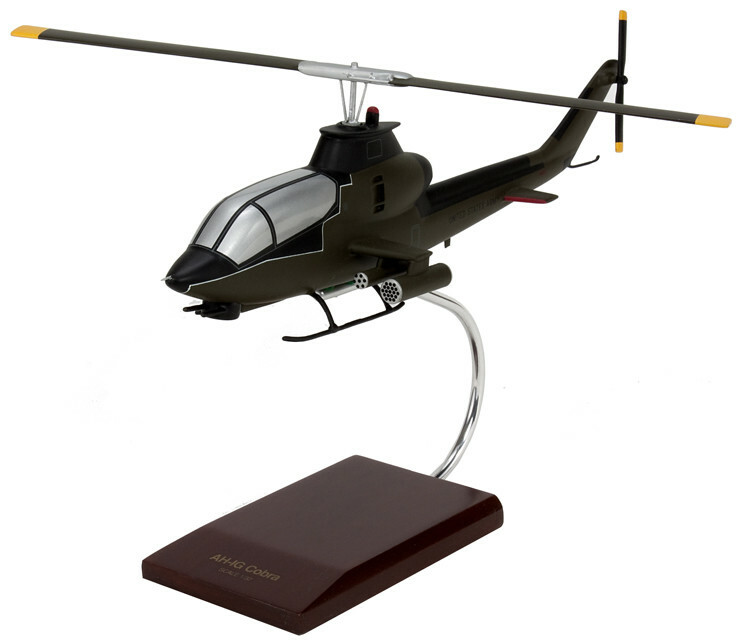 Crafted by hand from carefully selected wood and other materials, this desktop model is a near-accurate scale representation of the US Army AH-1G helicopter gunship. From the nose to the wingtip, it matches the contour and markings of the real thing. So whether you are a seasoned or an amateur enthusiast, you should definitely include this wooden helicopter model in your collection.